Cardinal numbers are largely different to English in spelling and/or pronunciation, but the construction of complex numbers is the same e.g. 444 fower hunner an fowertie fower. There are some minor variations in spelling/pronunciation between Scots dialects. Note that sometimes ‘one’ is used in English in an emphatic way, acting more like an adjective. ‘That’s one man I can’t stand’. 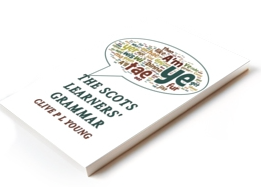 This has a special construction in Scots, ae, or yae in some dialects. Thon’s ae man a canna thole. This is ae used as an adjective. Ordinal numbers nearly all end in -t ie first, saicant, third (irregular), fowert, fift, saxt, seevent, echt/aucht, nint, tent. Add -t to the cardinal numbers for subsequent forms. Sometimes the ordinal is used instead of the cardinal e.g. the the twintie Mairch. The abbreviated form is 1t, 2t, 3d (irregular), 4t etc. Related vocabulary: single, dooble, threeple and the suffix -some to indicate a group of people e.g. a fowersome at the gowf (golf), a echtsome reel (a type of dance with 8 participants). Fractions are hauf, third, quarter, fift etc. Remember twa-three, three-fower mean ‘a few’ and a dizzen (dozen).